Wildfire events can be swift. They can occur during the day while you are at work or at night while you and your family are sleeping. And there can be very little warning. Wildfires can move at incredible speeds, often generating their own weather. High winds, heat, dense smoke, and flying sparks and embers are all common during a wildfire. The noise from a wildfire can be deafening, and causes panic in many. Homeowners living in the wildland/urban interface need to be prepared to evacuate themselves, their pets, and their livestock in the event of a wildfire disaster. Planning is key to a successful evacuation. Planning also decreases stress and confusion in what is a very frightening situation. Making a Plan will help you ready yourself and your family as well as your pets for evacuation. If you are lucky you will have ample warning about an approaching wildfire. Local authorities may give you an evacuation notice and say you have a half of an hour. Or you may have no warning at all. In the Event of a Wildfire provides you with checklists to get you, your family, and your pets and livestock out safely. The key to successful evacuations is that landowners leave early. Sixty percent of lives lost to wildland fire are of those that chose to stay and wait and see, and then evacuated too late. Many people have died in wildfires because they waited too long to evacuate and became trapped either in their homes, on their properties, or in their cars. If You Get Trapped gives some suggestions of what you can do if you were unable to evacuate in time and become trapped in your home or car. Caution should also be used when returning home after a wildfire. Hazards, as well as emotions, can be high. Early evacuations save lives and allow responding personnel to focus on the emergency at hand. Please evacuate promptly when requested! The terms Voluntary and Mandatory are used to describe evacuation orders. However, local jurisdictions may use other terminology such as Precautionary and Immediate Threat. These terms are used to alert you to the significance of the danger. All evacuation instructions provided by officials should be followed immediately for your safety. As with many natural disasters, wildfires are unpredictable. 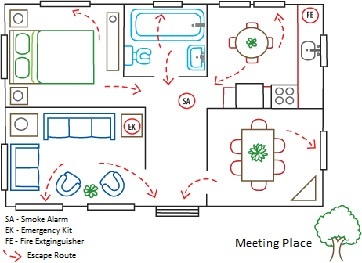 Evacuation planning should be done well ahead of time and parts of it should be rehearsed. Establish an evacuation plan and practice fire drills with your family. Plan several escape routes off of your property in the event that the main access roads become block by fire. Practice fire drills that include all aspects of your evacuation plan. Pre-plan an emergency community fire procedure and an alert system with your neighbors. Have a place to go. Make arrangements with friends or relatives who live in town or in another area. Establish meeting places in case you get separated. If all of your family members are not at home when a wildfire threatens, it is vitally important that you have an arranged for a place to meet that is in a safe location away from your property. Children should know who to call and where to go in the event they are home alone when a wildfire threatens. Most schools will have an evacuation plan for students. Find out what it is ahead of fire season. Know your fire protection district; post their number by all telephones. Have contact information for all your pre-arranged locations readily available, and program these numbers into to you and your children’s cell phone contact list. Designate a relative or friend outside the area as a common contact if you cannot reach each other after evacuation. Food and water for three days and/or special dietary foods. Baby or pet supplies including special food, sanitary items and play items. Prescription medicines, medical equipment and important medical records. Clothing for several days. Include socks, boots or close-toed shoes, long-sleeved shirts and long pants. You could add leather gloves, a bandana and a hat as well. Phone chargers and extra phone batteries. Identification, drivers license, cash, debit and credits cards. Wills, living wills, power of attorney, insurance policies, contracts, deeds, stocks, bonds, and tax returns. Passports, social security cards, immunization records. An inventory of household goods. If you have pets or livestock, make arrangements for them as well. Many counties have emergency evacuation plans for pets and livestock in place. Find out what they are. If no plan is in place contact your local veterinarian for locations to brings your pets and/or livestock. Before a catastrophe strikes and you're faced with a loss, make a home inventory – lists, pictures or a videotape of the contents of your home. After all, would you be able to remember all the possessions you've accumulated over the years if they were destroyed by a fire? Having an up-to-date home inventory will help you get your insurance claim settled faster, verify losses for your income tax return and help you purchase the correct amount of insurance. In the event of a wildfire call 911 or your local fire protection agency or district to report the blaze. Also start your neighborhood emergency phone tree. In some areas, homeowners may receive automated telephone notification and/or text on their cell phone. If there is time a members of your local fire services, law enforcement, or emergency responder agency may stop by to personally alert residents during the evacuation. Media outlets are another good source of information and radio stations, Emergency Broadcast Systems and local government websites can be checked for status updates. DO NOT WAIT TO BE TOLD TO EVACUATE. Sixty percent of lives lost to wildland fire are of those that chose to stay and wait and see, and then evacuated too late. First, ready yourself and your family for emergency evacuation. Gather all persons in the household together and let everyone know you are getting ready to evacuate. Have everyone dress for safety. Put on socks, closed-toed leather shoes or boots, long pants, and a long-sleeved shirt. Grab a pair of leather gloves, a bandanna, and a hat as well. Park vehicles in the direction you will escape. Leave the keys in the ignition. Pack your emergency kit containing clothing, food, water, and valuables in your vehicle. Put pets in pet carriers and in a safe, accessible place, ready to load into your vehicles when you leave. Load horses or other livestock that will need to be evacuated. Notify others when you are leaving and where you plan to go. Wildfires are notoriously unpredictable and even the best laid plans can sometimes go amiss. This is why it is crucial to be prepared and evacuate as early as possible. If you do find yourself trapped by a wildfire, there are a few things you can do to decrease risk and injury and increase your chances of survival. It will be very important to remain calm and keep everyone together. The roar of a wildfire can be extremely loud and the house will get very hot and smoky as the fire front passes, so emotionally you must be prepared to deal with the horrific sound and the strong natural urge to flee the house. Non-combustible siding or 30 feet or more clearing of vegetation from the siding. To survive, you must stay inside the house until the fire front passes. Although it will be very hot in the house, it can be four to five times hotter outside. Close all windows and doors. If your garage door operates on electricity, disconnect the unit and operate the door manually. Wet, or remove, swamp cooler pads to prevent them from catching on fire. Bring pets inside and consider placing in pet carriers to control their movement in the house as the roar of the fire comes. Leave exterior and interior lights on for as long as you have power. This helps fire fighters to find your house in the dense smoke during a fire. Plan for the loss of power and have water stored to put out burning embers or small fires after the fire front has passed your house. Strategically place garden sprinklers on your home where it is vulnerable to ignition, such as wooden stairs & decking, and turn them on. If it is safe to leave, do so. Seek immediate medical attention if necessary. Check the roof and extinguish any sparks or embers. Keep doors and windows closed, but unlocked. This will keep embers out, but make it easier for fiefighters to rescue you or your pets if needed. Continue monitoring your home for signs of smoke or embers for the next 24 to 48 hours. In most states, permission to return home after a wildfire is usually given by a local fire or law enforcement authority such as your county sheriff’s office. They deem it safe to return to your home once the wildfire and any home fires have been extinguished and when other hazards, such as downed power lines, do not pose a threat. Once you are given the “all clear” to go home, what you should look for outside and inside the home to ensure you and your families safety? FIRST check for the smell of gas. If you smell gas, leave the house and turn the supply off at the tank or outside valve. Open the doors and windows, and contact your utility provider. Check for electrical power. If there is power, temporarily turn it off until you’ve completed your inspection. If there is no power, see if the main breaker is on. Check roofs and floors to be sure they are structurally safe before entering. Inspect your roof and attic for sparks or embers, and wet them down immediately. Embers can enter attics through attic vents if not properly screened. Check for and extinguish any burning embers or smoldering debris found on your roof, in rain gutters, on the porch, or anywhere else on your property. Check back frequently over the course of several days to make sure they are completely out. Continue wearing boots, heavy clothing, and rubber gloves when sifting through debris and handling hazardous materials (cleaning solvents, paints, batteries, etc). Wear a mask while sifting through debris to avoid breathing in smoke and ash. Contact your utility providers (water, natural gas, and electricity) to restore service. Check for embers and smoke in the attic and crawl space. Do this every day for several days. Beware of hot spots, dust, ash, broken glass, and other sharp objects. Do not start cleaning or throwing away anything until you have contacted your insurance company. Ask your insurance provider what you should do about covering broken windows, doors, and other exposed areas, pumping out water, and any other activities you may need to do to secure your home. Take pictures and/or video, and start a list of damaged belongings. Do not allow children to play in the area. Be aware that animals may have taken shelter in your home, garage, or outbuildings. Leaving a door open will allow animals to return on their own to their natural surroundings. Animals that appear injured or unwilling to leave may require you to call animal control. The rule of thumb for food and medications after a fire is if in doubt, throw it out. You should discard any food, beverages, or medications exposed to heat, smoke, or soot. The potency of some medications can be altered by exposure to heat, so check with your doctor before using any prescription or over-the-counter medicines. Canned goods that are dented, bulging, or rusted or that have been charred or exposed to extreme heat should be discarded. Refrigerators and freezers may not be airtight. If the power was out, you should discard any meat, seafood, milk, soft cheeses, eggs, prepared foods, and cookie dough that have been above 40°F for over two hours. Do not refreeze frozen food that has thawed. Fresh food such as produce, dairy, meat, fish, and eggs. Any opened containers and packages. Containers with peel-off tops or cork-lined, waxed cardboard, or paraffin (waxed) seals. Food in cardboard boxes or wrapped in paper, foil, plastic, cellophane, or cloth. Staples in canisters such as flour, sugar, spices, seasonings, and extracts. Stored raw foods such as potatoes, apples, and onions. Preparing horses for a wildfire evacuation requires an extra level of planning, preparedness and practice. Building a Horse Evacuation kit (PDF, 8 MB) for each horse, and having a plan for them that’s been practiced, increases the potential your horse(s) will be able to leave when you do. If the wildfire’s proximity does not permit the time needed to load horses, it’s best to turn them loose and not leave them confined in a barn or pasture. Close the doors and gates so they can’t re-enter the area. Being familiar with what to expect in a wildfire evacuation, knowing how and when to leave and building a Horse Evacuation kit (PDF, 8 MB) for each horse will expedite leaving safely when fires happen. One way to easily store important information you may need for your horses is to scan the recommended documents and photos on the checklist and keep them on a flash drive that’s permanently stored inside the NFPA Horse Evacuation kit (PDF, 8 MB). Consider having two identical flash drives and give one to a friend or relative that lives in a neighboring community; that will help provide the information you need if there wasn’t time to grab your kit when the public alert was received. You play an important role in helping your pets stay safe in a wildfire. Make sure they’re included in your family’s evacuation plan; and build each pet their own pet evacuation kit (PDF, 10 MB). It doesn’t take a lot of time to build one, and it can usually be done using things you already have at home. This checklist (PDF, 10 MB) will help you customize an evacuation kit for the pets in your family and ensure they’re ready to go if you need to evacuate during a wildfire. When building the kit, remember it needs to be a size and weight that can be easily loaded into a vehicle when evacuating quickly.